We went to the Cardinals/Brewers game last night. If you had asked me two weeks ago if the Cardinals would have already clinched the division before this game, I would have said, "Yes!!" Well, the Astros seemed to come out of nowhere and, at the same time, the Cardinals had a 7 game losing streak so the "magic number" was stuck at 5. The Cardinals won on Wednesday so, at the start of last night's game, the "magic number" was 4. The game didn't start off well as the Brewers scored one run in the first. The Cardinals came back with three runs in the second and then never looked back. The final was 10-5 Cardinals. I think everyone was watching the scoreboard for the Astros/Braves game as much as they were watching the Cardinals game. When the Braves won, Ernie Hayes played the familiar tomahawk chop. The fans actually did the tomahawk chop, a sight I never thought I'd see at Busch Stadium. Yes, I did play with my new "toy" yesterday but I can't post any of my creations yet. I'm mailing the cards this week so, once the recipients receive them, I'll post them here. Hee hee hee...ok, so it's really Bo Bice but my niece thinks Bob Ice is funnier! Anyway, we saw him in concert at the Bottleneck Blues Bar at Ameristar Casino tonight. The concert was great! Even Bill, who wasn't really looking forward to this event, enjoyed it. Bo Bice was the first American Idol I really liked. I always watched the American Idol audition shows and then stopped watching once they chose the final 24. The season before last, however, there were two singers from St. Louis so I initially started watching just to see how far they would go. I wasn't really a fan of either one of them so I wasn't disappointed when they were eliminated. I kept watching because I was hooked. There was actually a rocker on American Idol and I was glad! I was tired of the cookie-cutter pop singers. Anyway, I voted for Bo many times each week. I bought his album last spring and I can honestly say that I love every song on the CD. The concert started at 7:00 and was over by 8:20 (no warm-up band, thank goodness). Afterward, we ate at Amerisports Bar & Grill and then tried our luck at the slots. We're not big gamblers. Case in point; we each started with $20; Bill left with $33 and I left with $10. Woohoo, we made $3. I'm taking a vacation day tomorrow and am planning to run a few errands and then play with my new toy...details to come. Stay tuned. 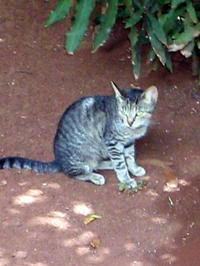 In addition to the usual birds and seagulls, we saw a wide variety of wildlife during our stay in Hawaii. 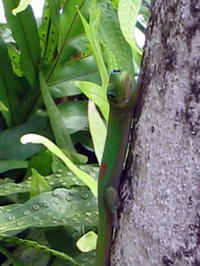 We always look for the Gecko (Mo'o in Hawaiian) which can usually be found climbing up a palm tree or sunning on a leaf. My nephew, Geckodude, has a Leopard Gecko so we were sure to take several picture of the Gecko's in Hawaii. 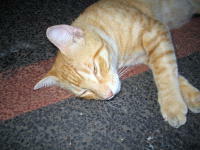 This particular one looked as if he were posing for the camera! 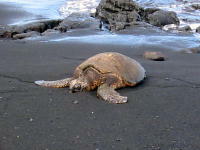 We saw green sea turtles or Honu laying on the black sand beach on the south shore of Hawaii. They sit on the sand for a while, just taking it easy and resting. They really are cute. They are endangered and there is a sign warning visitors not to get too close to the turtles or disturb them in any way. 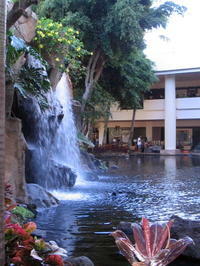 There is a pond and waterfall on the back side of the hotel right outside the hotel lobby. It's beautifully landscaped with palm trees and tropical flowers. 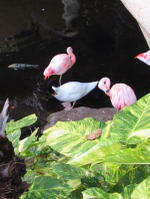 The pond is home to goldfish or coy as well as pink flamingos and a black swan. I think the swan and the flamingos know how good they have it at the hotel and don't seem too eager to venture out on their own! Although we have a great time on each island, I'd have to say that Maui is our favorite. We stayed in Kaanapali at the Westin Maui. I fell in love with this hotel when we stayed there in 2001 and I just had to stay there again. It's so pretty and the location is perfect...close to Lahaina and all of the wonderful little shops and restaurants. The beach is great and isn't too crowded and the pool is spectacular. We spent a several days at the pool/beach just reading, relaxing, etc. We dined at Maui Brewing, I'o, Hula Grill, and Lahaina Grill. We went to a luau at Old Lahaina Luau and it was great. 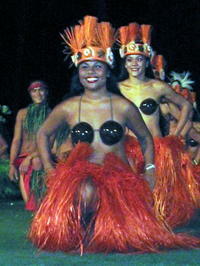 We hadn't been to a luau since 1991. I even ate poi and, although it wasn't too bad, I think it's an acquired taste. I thought that perhaps they had improved the taste since the last time I ate it but, no such luck. We had several lunches at the Barefoot Bar which is the casual outside seating for Hula Grill. The crab and macadamia nut won tons are fabulous! We took a tour of Molokai on Tuesday. 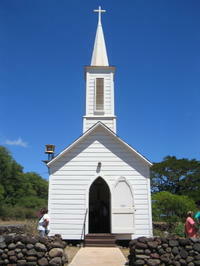 The tour included a visit to a coffee plantation, macadamia nut farm, St. Joseph's Church which was built by Father Damien in 1876, and lunch at Hotel Molokai. The island is very Hawaiian and there are very few tourists. The two hour ferry ride back to Maui was an experience, to say the least. I'm glad I took Dramamine. Otherwise, I would have been standing next to the lady who was positively green and hanging over the railing...poor thing! I'm sure she thought that the boat ride would never end. We went horseback riding at Mendes Ranch on Wednesday. We went horseback riding on Kauai 5 years ago and had a great time. 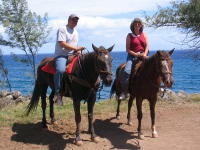 We decided back then that our next trip would include horseback riding on Maui. The views were spectacular. During the two hour ride, I kept thinking that very few people get to see these sites! My horse's name was Samantha and Bill's was Mauna Kea. Toward the end, Samantha galloped up the last hill and then slowed down. She seemed to sense that I didn't want to gallop so she slowed down and just trotted the final 100 yards or so. We spent 4 days on the "Big Island" of Hawaii. Bill had never been to the Big Island before and the last time I visited the island was 1982. We stayed at the Sheraton Keauhou Beach Resort and it was gorgeous. Since there aren't many swimming-friendly beaches on Hawaii, we spent our swim time at the pool. It was beautiful and it was right next to the ocean so you could hear the waves crashing on the shore. 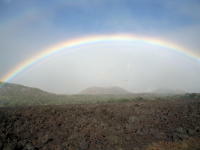 On Wednesday, we took a tour to Mauna Kea which is the the tallest volcano on the island at an elevation of 13,792 feet. The tour guide stopped at about 9,000 feet so we could eat dinner and get acclimated to the elevation. We actually had to wear parkas and mittens at the top since it was only about 35 degrees. I think it would be funny to use this picture on our Christmas cards with a caption reading, "Aloha from Hawaii." Hee hee hee. Unfortunately, we couldn't see the sunset because clouds moved in. We also couldn't see the stars but all was not lost. We saw a spectacular rainbow on the way up to the top. The picture doesn't even do it justice. 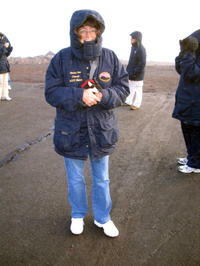 On Thursday, we drove to Kilauea which is an active volcano that has been erupting since 1983! We couldn't actually see the lava but we could see the steam where it hits the water. 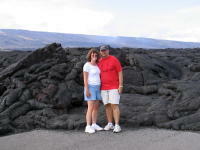 You can get a view of the lava if you hike about 3 miles over rough terrain (lava) and then wait until dark. You then have to walk back in the dark... an activity strongly discouraged by the park rangers! We decided to be content walking the 1/2 mile on pavement and then a 1/4 mile on lava to view the steam rising from the ocean. This is a picture of the lava where it flowed right over the street. We had wonderful dinners at Huggo's, Kona Brewing and Pa Leo. Both Huggo's and Pa Leo offer wonderful views of the ocean and Kona Brewing offers wonderful brews of Hawaii. The Fire Rock Pale Ale and the Black Sand Porter were my favorites. Next stop...the island of Maui. I started to post a blog entry last night and then I decided that I needed to come up with a better format in which to present the highlights of our trip. If I list everything in one post, it would take forever to read. I've decided that the best way is to post an entry listing the highlights of each island and then perhaps a few miscellaneous posts to wrap things up. First, a little background on my favorite state. Hawaii consists of 132 islands and atolls. There are 8 main islands - Hawaii, Oahu, Maui, Kauai, Molokai, Lanai, Kahoolawe and Niihau, all of which are inhabited with the exception of Kahoolawe. The only two islands I have not visited are Niihau or "The Forbidden Isle" (completely restricted until recent years and still only limited tours granted) and Kahoolawe or "The Rocket Island" (formerly used by the military as a training ground). Our first stop was Oahu which is also known as "The Gathering Place" as it is the most populated island. 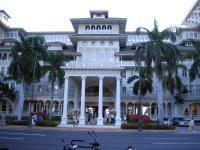 We stayed at the Moana Surfrider which is the oldest hotel on Waikiki beach. 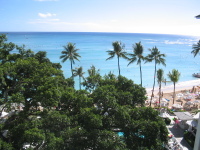 There are great views of Diamond Head, a large banyan tree in the courtyard and a great beach bar. We stayed here for the first time on our last trip in 2001 and it's definitely my favorite hotel in Honolulu. When we arrive, we check into the room and then go th the Beach Bar for our first Mai Tai. On previous visits, we have visited Pearl Harbor, driven around the entire island (it only takes about 6 hours and that includes stopping to take pictures, eat, see sites, etc) and swam in Hanauma Bay. This time, we spent two relaxing days on Waikiki Beach. I actually even have a tan now which, considering I have a pretty fair complexion, is quite a feat! We had great dinners at Duke's Canoe Club, The Surf Room, and Tiki's Bar & Grill. I ordered Mahi Mahi all three nights! I will occasionally order Mahi Mahi in St. Louis but it just doesn't taste the same. For example, the Mahi Mahi I had at Duke's was caught that morning off the coast of Kauai. You can't get any fresher than that! Our room overlooked the banyan tree courtyard and the ocean. The view was absolutely gorgeous. We had a large balcony with a sliding glass door we could open in order to let in the breeze and the sound of the waves crashing on the beach. Next stop...the island of Hawaii. We arrived back home yesterday at about 10:30am (5:30am Hawaii time). It was such a great trip. I can say without a doubt that Hawaii is my most absolute favorite place in the world. I've been to Hawaii six times and it's just as special now as it was on my first trip there in 1977. I will be posting more details about the trip including pictures within the next few days. Now, however, it's back to reality. I have two weeks worth of laundry to finish and dinner to cook. We arrived in Kaanapali, Maui this afternoon. We have already spent 3 days on Oahu and 4 days in Kona, Hawaii. We're having a great time. It's 5:35pm local time right now. We're going to leave shortly and drive up the coast for dinner. I'm not sure I'll have another chance to post but I wanted to make sure that I posted at least one entry from Hawaii. We're packed and ready to go. We have an ample supply of snacks in our carry-on bags (candy, cookies, Chex Mix, etc - hey, the flight is 9 hours long! ), my laptop is charged and ready to go, the house/kitty sitting instructions are printed, all liquids and gels are packed in the checked baggage and the select CD's and DVD's are housed in the CD travel case. 24 hours from now it will be 4:45pm Hawaii time. I will have consumed my first Mai Tai and will most likely be strolling along Kalakaua Avenue or maybe checking out the various wares at the International Market Place. I can't wait! There is a web cam on Waikiki Beach. I'll be sure to wave! Aloha.